Crochet scarf patterns can be made and worn all year long. You're not going to want to wear a huge super scarf when it's warm out. On those days, you'll be looking for a lightweight cotton crochet scarf that serves more for decoration than function. These ten crochet lace scarf patterns are openwork designs that add that elegant handmade touch to your spring and summer outfits. Have fun making the different designs! Filet crochet is one type of lace crochet. Filet crochet patterns use graphs, so that is something that you'll have to learn if you are new to the technique. However, it's pretty easy to pick up, and this crochet pattern by Illuminate Crochet is a simple one for beginners to the niche. It comes with terrific instructions for filet crochet. The beautiful pastel colors are an added bonus for a lightweight scarf that might be worn in the spring. Another type of crochet lace is pineapple lace. When worked in lightweight yarns, pineapple lace crochet patterns are particularly dainty. They have an organic flow to their shape. This free scarf pattern by Undeniable Glitter uses a sequined silver yarn to make an elegant addition to any outfit. This crochet scarf designed by 5 Little Monsters uses a small version of the pineapple lace motif to create a vertical row of berry shapes in the center of the design. This one is a bit denser and warmer than many pineapple crochet scarves, making it a great scarf for transitioning between cooler and warmer weather. There are so many different types of crochet lace! Broomstick lace uses a dowel (or "broomstick) to create big open holes in the fabric that you're making with your crochet hook. It's a great technique that is fun to learn and will add something new to your repertoire. This broomstick lace crochet scarf pattern by Speckless links to a tutorial for technique. The crochet butterfly stitch technique is not necessarily a lace technique. 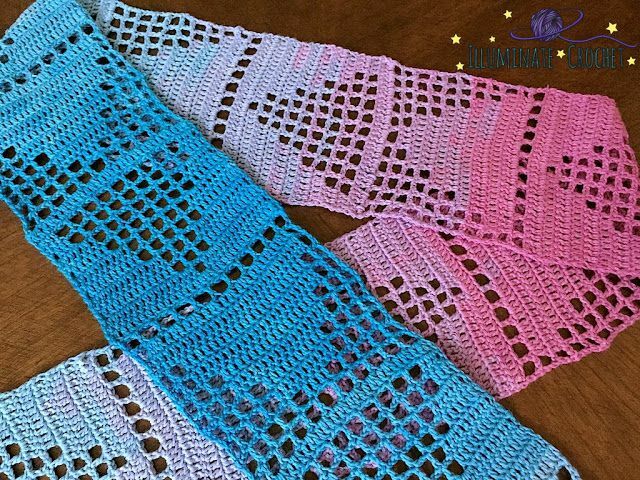 The open nature of butterfly stitch crochet patterns makes for lacy scarves. Plus the butterfly is an excellent symbol for the warmer month of the year. This free crochet pattern by Lanas Hilos includes a matching pattern for a hat with the same butterfly detail. At first glance, this stitch pattern almost looks like the butterfly stitch. It has worked a bit different to create an openwork cube motif. This lacy design by Grow Creative allows for a lovely breeze to keep you comfortable when wearing the scarf on warmer days. This free crochet scarf pattern by Fiber Flux is made using a variation of the v-stitch. It uses more than one double crochet clustered together with large chain spaces between the groupings. This creates an open design. Combined with the yarn choice, this scarf is perfect as a warmer weather accessory. This crochet scarf uses only basic stitches, including double and treble crochet stitches. Their placement, combined with chain stitches, allows for an open design that's perfect for a summer scarf. The airy pink crochet adds to the lightness of the scarf. This was designed by Wiam's Crafts. This crochet scarf is worked in silk lace that is so soft to the touch. It is a free crochet pattern by Arlene's World of Lace, available for download through Ravelry. You must be able to read symbol charts to work this pattern. Believe it or not, you can create a crochet lace scarf using only single crochet stitches. While these stitches are usually dense, they can be made openwork with a slight shift in materials. Mama In a Stitch uses a lightweight yarn with a large crochet hook to create the openness in this fringed crochet pattern.